WHY Do We Use The Lords Prayer Corporately? : From The DS Blog Series WHY? by doublespringschurch.In Grow.Leave a Comment on WHY Do We Use The Lords Prayer Corporately? : From The DS Blog Series WHY? WHY PRAY THE LORD’S PRAYER? If you have worshiped at Double Springs Church for any period of time, you know that we regularly conclude the pastoral prayer in the morning worship service with what is known as the ‘Lord’s Prayer.’ It may be that you have wondered why we pray these words in public worship on a weekly basis. Is it really necessary to pray these words each week? Won’t this practice simply lead to a form of cold, dead religion? Perhaps, you have asked similar questions or even doubted the wisdom in this practice. If that’s you, I commend you for caring enough to think through what we do at DS Church and I ask that you let me offer a few answers in defense of what many – both today and throughout the history of the Christian church – have understood as a wise and biblical practice. Why, then, pray the Lord’s Prayer? Because Jesus taught us this prayer. In his “Sermon on the Mount,” Jesus instructed his listeners not to “heap up empty phrases as the heathen do, for they think they will be heard for their many words. Do not be like them, for your Father knows what you need before you ask him. Pray then like this…” (Mt 6.7-9a). In this sermon, Jesus goes on to give us that prayer we know as the Lord’s Prayer. I think His point was that God is not impressed with the quantity of words or eloquence of speech that we use in prayer; rather, he desires prayer that is done in faith and emphasizes the worship, kingdom, provision, grace and protection of the Father – all of which are contained in this prayer given by Jesus. He commands us to use these words because it is a model prayer and easily memorized. In his compassion and genuine (even Pastoral) concern for his own, the Son of God supplies us with a prayer that is helpful in our weakness. He knows that, due to our frailty and sinfulness, we find prayer to be difficult. It not only requires faith, but humility and intense focus. We often find our prayers to be disorganized in thought and lacking in passion. Truth is, at times we do not even know what/how to pray! When that happens, we have the Lord’s Prayer. Rest assured, this prayer is not full of empty phrases or cold orthodoxy; not at all! Instead, it contains the most important aspects of our communication to our Father in heaven… adoration, confession and petition for body and soul. When we pray this prayer in faith, we should not be concerned that we are offering up some religious repetition; rather, we should be comforted to know that we are praying the very prayer that the Son of God – our Prophet, Priest and King – has taught us to pray. Because this pray er provides us with an outline for our prayers. When we pray this prayer regularly, its form becomes fixed in our minds. That is a good thing! An outline of how we are to pray is established in our memory so that life’s priorities are brought into focus. This is wonderfully important because often, our personal prayers are grossly out of focus. Because of our sinful nature, we tend to put more thought into our personal concerns than the glory of God. 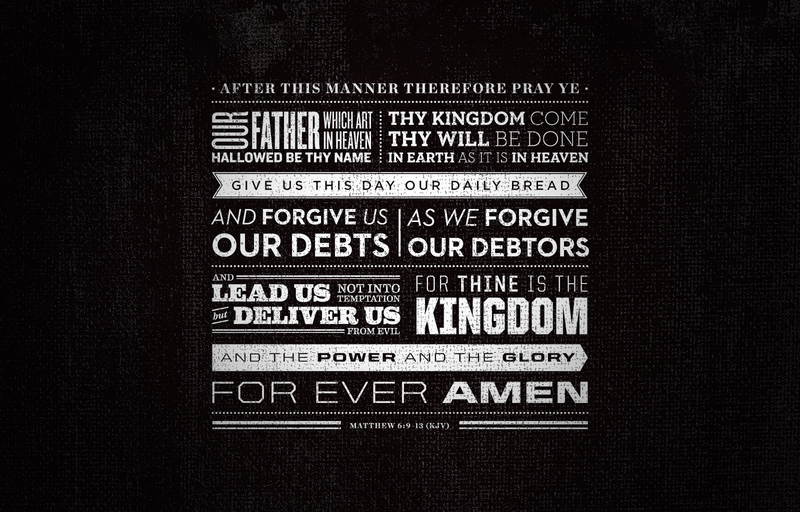 As an example, our prayers often look something like this…“Our Father in heaven, give us this day our daily bread”. See the problem? We instinctively think about ourselves first so we easily skip the place in which our prayers should begin: adoration of the King and concern for his kingdom. It is not that God is unconcerned about our personal needs – He most certainly is! But in prayer we must have our priorities straight as we approach the God of the ages. To aid us in this, praying the Lord’s Prayer serves to regularly assist us. Through our regular use of the Lords prayer, we become so familiar with this prayer that we naturally use it to structure our personal communication with our Father. Because this prayer allows our children to participate in public worship. Corporate use of The Lords Prayer allows our children an opportunity to be involved in worship. From their earliest years they will become familiar with the practice of uniting with God’s people in one voice on the Lord’s Day. This is especially important for Churches like DS Church as we are family integrated in our model. Let me say that those concerns are certainly plausible. That COULD become the case if we, as the Spiritual leaders of our homes, aren’t really careful. Concerning the Lords Prayer, we must remain diligent to take up the responsibilities of discipling our children in prayer (Deut 6.4-6; Eph 6.1-4). We’re not only teaching our children memorization by repitition….we’re teaching our children what it means when we pray, “Hallowed be Thy name,” “Thy kingdom come,” “Lead us not into temptation” and so on. We have an awesome opportunity to use the individual petitions of the Lord’s Prayer to teach them about God and his kingdom, about the nature of the Father and our absolute dependence on him. Because this prayer gives us continuity with the historic Christian church. As we look at the “orders of worship” (liturgies) of the historic Christian church, we find that the Lord’s Prayer has always been a regular part of the worship service. Consider the Great reformation itself…In all of the liturgies of the Reformation – the liturgies composed by Martin Bucer (1539), Thomas Cramner (1552), John Knox (1556) as well as others – the practice of praying the Lord’s Prayer was included as a regular part of public worship. At no time was this practice deleted from the service. Reformers sought to remove the superstition and idolatry that had become the norm in the Roman Catholic tradition they were trying to break free from but there some things they left in place (such as the use of The Lords Prayer) because they found them to be wise and Biblical practices believed were biblical and useful – they did not throw out the baby with the bath water! Additionally, the Reformers not only found this practice to be biblical, but also, like everything they included in the worship service, they found evidence of this practice in their study of the ancient church fathers. The Reformers sought to maintain the continuity of worship in the church, passing down to future generations the good and biblical practices of previous generations. This was a wise practice and one of the many reasons why we continue to use The Lords Prayer weekly at DS Church. I pray that this article sheds a little light on why we “do what we do” at DS Church concerning the Lords Prayer.